alaTest has collected and analyzed 28 reviews of Hitachi DZ-GX3200E. The average rating for this product is 3.5/5, compared to an average rating of 4.1/5 for other Camcorders for all reviews. Reviews about the reliability and portability are overall positive. The image quality and price also get good opinions, whereas some have doubts about the color. We analyzed user and expert ratings, product age and more factors. Compared to other Camcorders the Hitachi DZ-GX3200E is awarded an overall alaScore™ of 78/100 = Good quality. Hitachi's DZ-GX3200A delivers decent video quality at a relatively inexpensive price for a DVD camcorder. Proprietary 6th Generation Hitachi technology delivers high quality 2.12 Mega Pixel resolution in a sleek, lightweight and compact design. Oversampling Advanced Image Processing captures more pixels per frame to create a sharper, more detailed image. Recording in true 16: 9 widescreen format straight DVD that can be finalized easily by pressing a single button. With PC and Mac Video Editing Software, simply transfer video from Camcorder to computer for editing, and then burn back to one of four formats of DVD in your camcorder. The Photo Frame Grab allows you choose the perfect frame of video action and store it as a still image on the removable SD card. 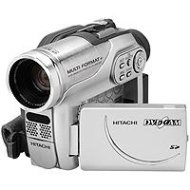 Hitachi delivers superior technologies and picture performance in DVD Camcorders.